Is your least favorite part of the day leaving your best friend behind? Are you tired of coming home to chewed-up sofas, shoes, and garbage in places it shouldn’t be? 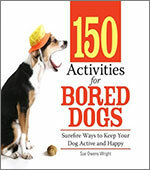 Now, you can turn your bored dog into an active dog with 150 Activities for Bored Dogs: Surefire Ways to Keep Your Dog Active and Happy. Finally, you can leave puppy guilt behind, thanks to 150 Activities for Bored Dogs: Surefire Ways to Keep Your Dog Active and Happy. • Language learning—is Fido bow-lingual? • Memory—does Toto have total recall? • Problem solving—is Prince ready for Princeton? 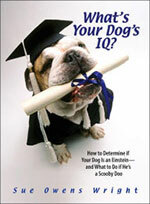 And, just in case your Fido’s IQ is less than stellar, What’s Your Dog’s IQ? reminds you that the true measure of a dog is not the size of his brain, but the size of his heart. 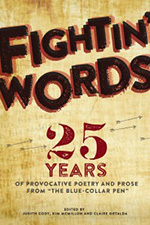 Sue’s story “Homed For The Holidays: A Christmas Wish for Homeless Pets” was published in Fightin’ Words: 25 Years of Provocative Poetry and Prose from “The Blue-Collar PEN,” along with works from many illustrious authors like Norman Mailer. 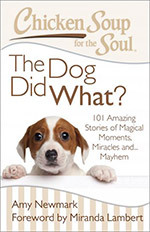 Read Sue’s story “Crazy for Daisy” in Chicken Soup for the Soul: The Dog Did What? 101 Amazing Stories of Magical Moments, Miracles and… Mayhem. Lost Souls: Found! 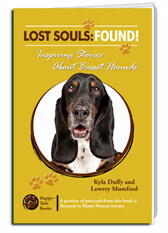 Inspiring Stories About Basset Hounds is full of 60+ stories from people who have fostered and adopted Basset Hounds.